Egyptology is an exciting and rewarding field, and every discovery has a story behind it. 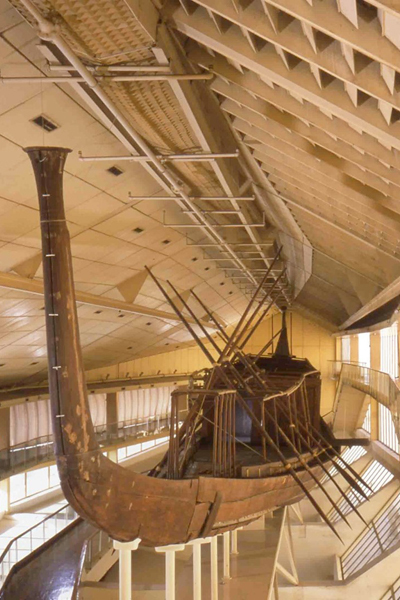 The discovery of the Solar Boat of the Khufu in 1954 is one of the most interesting. At that time, Mohamed Zaki Nour was chief inspector of antiquities at Giza, and Kamal Al-Mallakh was a young architect in the then Antiquities Service. 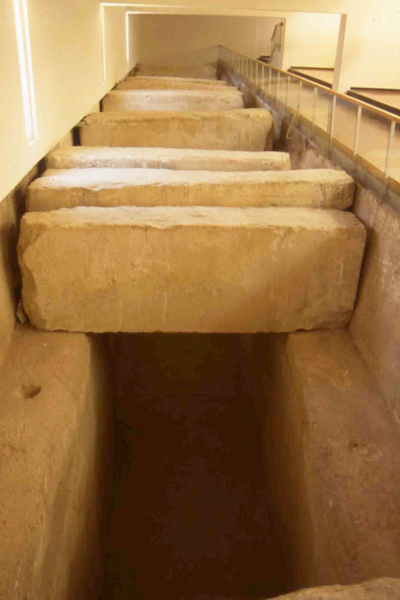 The area south of the Great Pyramid was buried under debris reaching a height of seven metres. But the idea of removing it came only after a visit by king Saud of Saudi Arabia, who commented on the debris during a visit. Al-Mallakh, being an ambitious and energetic young man, set his workmen to the task. Their chief was Garas Yani, an Upper Egyptian who had been trained by some of the best foreign archaeologists. In July 1954, Yani uncovered several huge limestone blocks lying next to each other at ground level. It was obvious to him that they covered a large pit. In great excitement, he went to look for Al-Mallakh and found him in a downtown Cairo café with his close friends, the famous writer Anis Mansour and Maurice Guindi, a correspondent for the news agency United Press International. Whether with the advantage of hindsight, or as the result of an inspired guess at the time, Al-Mallakh said he had been convinced from the first that the southern enclosure wall had been built closer to the Pyramids than the northern and western walls precisely to conceal one or more boat pits, and that Yani had also known this. Be that as it may, the announcement caused great excitement, and the group left the café in haste, jumped into Mansour’s car, and headed for Giza. Mansour recalls that the car broke down on the Pyramids Road from overheating. “The curse of the Pharaohs,” he said. Guindi wasted no time in publishing an article on the find with UPI, and the New York Times ran story after story about the discovery of the Solar Boat. 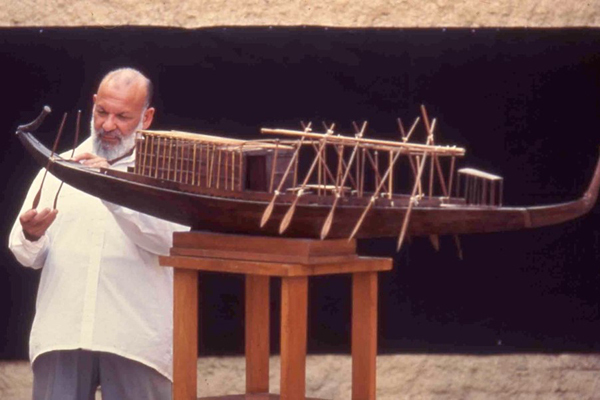 Anis Mansour later told me that he had called the distinguished Egyptologist Selim Hassan for his opinion about solar boats, and that meanwhile Al-Mallakh had embarked on a lecture tour in the United States to talk about the discovery. Ever charismatic, the now famous Al-Mallakh shared his passion for Egypt with academic audiences across the country and gave various television and radio appearances. The tour was a great success. When Al-Mallakh returned to Egypt, the journalist Mohamed Hassanein Heikal convinced then president Gamal Abdel-Nasser that the site was well worth a visit. Together with an entourage of military officers, Nasser visited it. Later, Zaki Nour, an antiquities inspector at Giza, claimed that he should have had the credit for the discovery. Meanwhile, Abdel-Moneim Abu Bakr, dean of the Department of Egyptology at Cairo University, wrote an article outlining six points supporting his theory that the vessel was not a solar boat at all, but a funerary barge that had been built to transport the body of the deceased king from the capital Memphis to the Pyramid site. Moreover, there is no indication that it was ever used on the Nile. For one thing, the deckhouse is not big enough for a comfortable journey, and for another it does not have any windows. The most important evidence, recently discovered in Wadi Al-Jarf near Suez, is a papyrus that tells us that the king lived in a palace at Giza and not in Memphis. Needless to say, Al-Mallakh continued to regard the vessel as a solar boat connected with the age-old myth of the sun god eternally journeying across the heavens. Limestone blocks covering the pit were lifted using huge cranes, and a resinous solution was applied to the fragments of ancient matting to lift them up without damage. 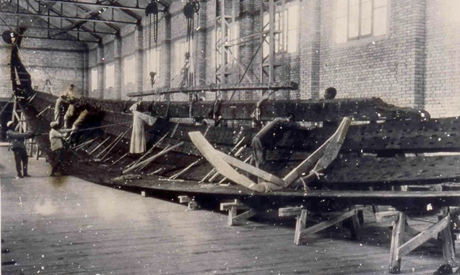 A platform had to be built over the working area to enable Youssef to conduct operations without putting pressure on the boat itself. Eventually, the ancient timbers were lifted, treated, and restored. Built for a king, this vessel had been dismantled before being buried, and Youssef almost single-handedly spent 14 years putting this giant jig-saw puzzle back together. Al-Mallakh could only watch from the sidelines. Al-Mallakh was a truly remarkable man. When he died in 1987, Egypt lost one of its most beloved sons. His appearance, which resembled a Pharaoh - tall and upright with a high forehead and a receding hairline - made him stand out on Cairo’s crowded streets. Though he was forced out of the Antiquities Department, he was not the kind of person to harbour grievances. He turned his attention to journalism instead and became a reporter for Akher Saa magazine and Al-Akhbar newspaper. At this point he reinforced his friendship with Anis Mansour, and together they shared many adventures. I enjoyed reading about some of those in Mansour’s weekly column Ayamna Al-Helwa (Our Sweet Days) in Al-Ahram. One day, I borrowed a car from my friend Ezzat Al-Saadani, a writer in Al-Ahram. It was a Volkswagen and the petrol gauge was broken. Even after I went to the University of Pennsylvania in the US as a Fulbright fellow to study for my doctoral degree, I visited him when I returned to Egypt on vacation. One day, he invited me for lunch at Anis Mansour’s villa in Giza. There, I met important personalities, including the writer Tawfik Al-Hakim. The domestic video camera had just been invented at the time, and Al-Hakim was quite taken with it, happy to watch images of himself on the screen. He wanted to test out his appearance, being concerned about how he looked from one angle or another, and which was the most flattering. I remember he wiggled his moustache to see if it was noticeable on TV. Toward the end of Al-Mallakh’s life, the Antiquities Service gave permission for the magazine National Geographic to investigate the Second Boat pit at Giza, and he was upset about not being included on the team. He fought for his rights, but to no avail. One night he called me at 9pm and talked for two hours about how upset he was at this treatment, his voice containing great sadness. I left for the United States the following day to attend the opening of a Ramses II exhibition in Denver, Colorado. Imagine my shock when I was awakened some days later by a call from Dorothea, his sister-in-law, telling me that he had passed away. I cried for two hours, my sorrow being perhaps even greater than what I had felt on the death of my own father. The story of the Solar Boat never ends, but I hope I have been able to give Al-Mallakh the credit he deserved as the one who first discovered it. I myself was able to prove that it was indeed a solar boat that the king, as a god, would symbolically use for his voyages by day. It was called by the ancient Egyptians the “mandjet” boat, while the one used for the night journey was known as the “msketet”. The oars of the boats were used to kill the wild beasts of the underworld, and the people would continue to worship the king after his death as a god.